In 2-quart saucepan, stir together quinoa, coconut milk, gingerroot, water and salt. Heat to boiling; reduce heat to medium-low. Cover and simmer 10 to 15 minutes or until most of the liquid is absorbed. Turn off heat; let stand covered 5 minutes. Stir in brown sugar. 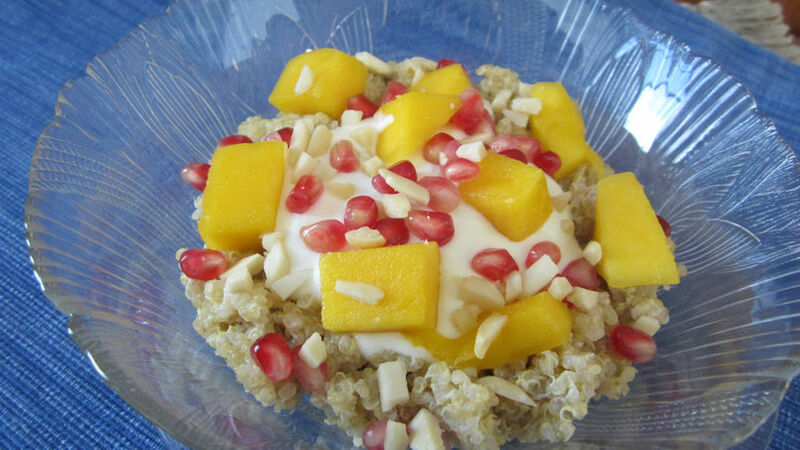 Divide pudding among 4 bowls, top with yogurt, mango, almonds and pomegranate seeds. Enjoy this delicious pudding made using quinoa, tropical fruits and Greek Fat Free honey vanilla yogurt – a perfect dessert or breakfast.